We are a family kennel of lagotto romagnolo but try to breed with profesional knowledge and the latest genetic info available. The lagotto puppies from us live in Slovakia, Austria, Germany, Czech Republic, Hungary, England, Spain, Latvia, Slovenien, USA.. They are great family dogs excelling at various activities, truffle search, agility, frisbee, mantrailing and many others, they attend also dog shows. All our dogs live with us in the house, also our puppies are raised in the house. They are used to children, other dogs and cats. They know how to behave in the pack. Our effort is to breed healthy dogs in compliance with FCI standards with great coats and good temperament. Our dogs are tested for JE (juvenile epilepsy), Storage desease, Furnishing, hip and elbow dysplasy and eye diseases. All our puppies have FCI export pedigree, EU petpassport, they are chipped, vaccinated and several times dewormed. They come with lots of hugs and kisses from us and we are always happy to hear from them. All puppies from S litter have found wonderful families. 18.12.2018 Our lagotto puppies from our Cassie x Zeus are here! 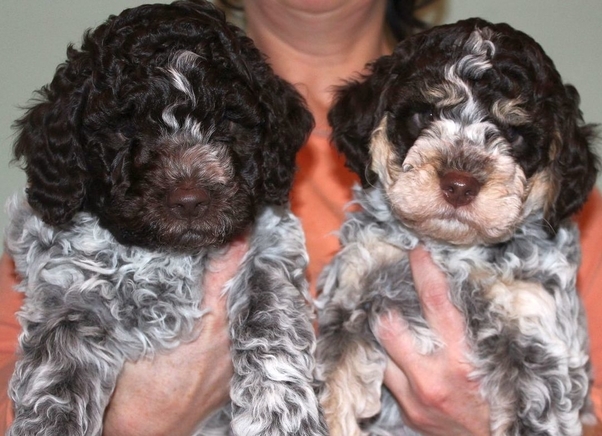 Lagotto puppies from our Cassie and Zeus (IT) have been born and they are 1 week old. A few pics of our chunky puppies can be seen in the photogallery. Our Robert (Radiva baby K Rob) has participated in his first show on 20.8. in Bratislava, we attach a few photos of him enjoying the ring. He got Very promising 1. Finally some info from the shows, which we / or our offspring participated in. On 11.1.2016 we took part in the President Cup Cacib Budapest show with two our dogs Eolo dei Boschi D´Oro and Il Granaio dei Malatesta Rebecca. Eolo got his last CAC to qualify for Hungarian Beauty Champion, he also got CACIB and BOB. Rebecca got CAJC and Best of Junior and both very nice words from the Judge Mr. Kardos Wilmos. We have received beautiful pictures from the owners of our puppy Radiva baby Caspian from our C litter. They are such lovely photos that we have to share them with you. 8.2.2015 Our lagotti love winter! We want to share beautiful pictures of our lagotto romagnolo offspring and our dogs in winter mood. They just love rolling in snow and frost does not seem to bother them :-), and where there is no snow, they have fun in training agility. Finally I can add the show results of our offspring and pictures from end of 2014. Two our girls participated in IDS Nitra in November. Radiva baby Beauty Sleep got Exc 1 on 30.11. and on 31.11 Radiva baby Bambulka obtained her last CAJC necessary to achieve the title Slovak Beauty Junior Champion. We have spent the weekend in Austria on two dog shows, on Saturday it was Bundessieger Tulln Cacib show and on Sunday the national CACA show. We have presented our lagotti and discussed about our beautiful breed with Lagotto lovers and people interested in the breed. It has been a great show with great results for our dogs.